Discussion in 'Sim Racing Hardware' started by GTPNewsWire, Jul 21, 2018. This article was published by Kyle Patrick (@SlipZtrEm) on July 21st, 2018 in the Hardware category. I had contact with Thrustmaster and they stated that GTsport will be supported in a future PD update with "interesting" features. Reminds me of how expensive the shifter is as a separate add on. Both of these items almost cost as much as a T150 with pedal set included! Can anybody help me spell; "overpriced"? I did look at this a while ago and decided it was overpriced and unnecessary junk. When playing PCARS2 or Assetto Corsa I use an old Android tablet and free (yes FREE!) app that gives me exactly this. You also can use a smart phone either Android or Apple and did mention the FREE apps available. DO NOT bother to buy this Thrustmaster toy just check out your app store. Or if you are too lazy have a look at this example https://play.google.com/store/apps/details?id=com.swatterco.assettocorsa&hl=en_AU Do your own research and save your money. Also i Should add *IF* you do pay a very small fee for the full app you get a lot more customisation. BeetesJuice, CTstryk, potvinsuks and 1 other person like this. I would buy one but it doesn’t work for GT Soorts ugh! Existing free apps or not, I really like mine. Yes, the price could probably be lower, but I’ll get my money’s worth. I agree. Free or even paid apps cant replace reall LED's. The LEDs are incredibly bright and a lot to immersion. I tried these free apps, but I just cant see the phonescreen in my peripheral view. Pcars dash have not only "leds", but all background changes to yelow or red so you dont need look to leds at all. I used that app.... It isnt bright enough when placed in Peripheral view.... thats why I wanted LEDS. I'm looking at the PS4 and doesn't have BT so how is the BT connection made? Maybe you didnt know, but the DS4 is connected by BT to the PS4. For the ones wondering... The BT display does fit exactly in the TS-PC open wheel rim. So i think TM is going to release the rim seperately. super_gt and FPV MIC like this. The brightness is too bright and it does not save its settings. Very limited list of supported games. And that will remain an issue as both Thrustmaster and the game developer need to be on the same boat. No Assetto Corsa, no Dirt Rally support, and probably never will be supported. Why will it remain an issue? Both the games you've listed are no longer supported at all, so it stands to reason they won't be compatible with any new products. Moving forward though, I'd expect most, if not all, newly released sim style racing games to have compatibility. eg. Dirt Rally (2015) isn't supported, but the sequel Dirt 4 (2017) is. Because I and probably many others prefer Dirt Rally over Dirt 4? Same can be said about any other title. The list of supported titles is and will remain small. If that's not an issue for you, fine. But for me it is. It has nothing to do with personal preferences, it's because those games you mentioned are no longer supported by their developers. Once development stops, so does all support and no more peripheral support is added. Of course the list of titles supported will remain relatively small in the overall gaming marketplace, but the same can be said for any sim racing equipment... it's a niche market. Moving forward though, I'd expect most, if not all, newly released sim style racing games to have compatibility. Assetto Corsa was in its last stages being supported, during the introduction of the BTLed. 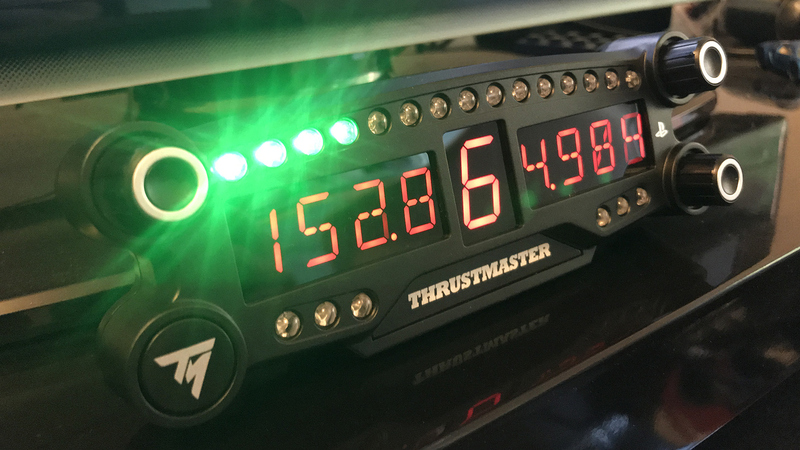 Thrustmaster is way too depended on gamedevs to implement the BTLed. As a customer it has all to do with personal preferences. PC2 support for the BTled has been flawed for a couple of months. The blue leds did not work. It has been patched luckily , but being on ps4 that takes quite some time. Yeah, the very very last stages (1 month???). I don't think peripherals for PS4 only would be high on their to do list and the patch had probably already been submitted. More a case of here's the Ultimate Edition+patch, seeya. All peripheral manufacturers are dependent on game devs for support of their products. For all the things that you say, I have to say yes. But those yes answers does not mean I agree with any of you are saying. I have an old car. Still the old car is supported on today's roads. I have a Logitech G25. Still that G25 is supported in today's games. Technically the G25 isnt supported by Dirt Rally on the PS4. If a Dirt Rally 2 ever comes out it will probably supported. Are they working on that? Agreed, but technically it isn't supported for any PS4 game, and being that the BT LED Display is PS4 only, that's what I've used as the base line. Any news when this will be supported on GTsport? I know, but still.... this is the consequence of bringing something to market where you are totally dependent on the devs to implement it. I agree. Can’t understand why PD wouldn’t implement compatibility unless they’re too busy doing other things right now. Well it took them a very long time to implement the CSL-E so I guess (hoping) implementation for the display by years end?